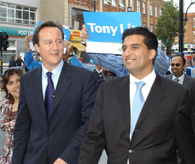 Tony Lit, Managing Director of Sunrise Radio, has been chosen from a large number of hopeful candidates to stand for the Conservatives in the by-election (held on July 19th). A local family man who was educated at a state school, he has had no previous involvement in the Party but is said to be joining because of David Cameron. The constituency as a whole has the second largest Asian community in the country, mostly concentrated in the Southall half of the constituency where one of the wards is 97% non-white (and where the LibDems are basing their new HQ). Lit's wealthy and influential father stood in 2001 as a "Sunrise" candidate and managed to beat the LibDems into fourth, so hopefully his son will bring a similar following with him! Another factor in his favour is that Sedgefield's by-election will stretch LibDem resources more than ours. CCHQ see his candidacy as quite a coup. The constituency's new campaign HQ is hoping for as much mutual aid from other constituencies as possible. We'll post details of how you can sign up to help later today. Go to CampaignTogether.com to sign up for helping out in all sorts of ways. Your Party needs you. Friday 12 pm update: Just to be clear, Tony did become a member of the Party before passing the Parliamentary Assessment Board. He has always voted Conservative but couldn't join the Party earlier due to his directorship of the radio station, a position which he has duly resigned from. Also, much credit is due to Grant Shapps MP for getting Campaign Together off the ground.